Pest Control in Mobile County, AL | Hadley Termite & Pest Control, Inc.
Hadley Termite & Pest Control, Inc. provides Canine Termite Inspections for all of Baldwin and Mobile County, AL. Termite inspections are traditionally performed by a knowledgeable, trained termite specialist. Using knowledge of termite habits, careful attention to detail, and a flashlight, termite inspectors look for signs of termite activity. We take that formula one step further and add a trained canine termite detective to the home inspection mix. Dogs can smell what termite inspectors cannot see. If there is no visible damage on a wall, many termite inspectors will clear a home for termites. Human technicians rely solely on their eyes. Dogs, with their acute sense of smell, can detect the presence of live termites even where no visible damage is present. For more details on Termite Dogs please click on the link. Treating your home for termites is important to protect your single biggest investment, your home. South Alabama is smack-dab in the center of the #2 hot spot for termites in the USA! (Hawaii is #1.) Don't gamble with your home, protect it from termites. Termites are looking for cellulose, the main building block of wood. They do not care if they find it in a tree stump, a pile of 2x4s left on the ground, or your home. As a matter of fact, your home is chock-full of lovely cellulose, in the stud beams, the sheetrock walls, and floor boards. And if you should have hardwood floors, even better! Quarterly Pest Control Service - Residential homes, with no specific pest issues, would be treated on a quarterly basis. Most of our focus for residential pest control is to keep the bugs from coming inside your home in Baldwin and Mobile County, AL, so most of our efforts are to the outside of the home. Prices vary depending on the size of your home, please call 251-961-7109 to schedule an estimate time. Monthly Pest Control Service - Restaurants typically need to be serviced monthly due to the high levels of traffic and high levels of cleaning in the store. Unless a homeowner has a severe bug-phobia, we discourage monthly pest control for single family residences. Fleas - Fleas are found on armadillos, raccoons, and opossums, all of which are found here in South Alabama. The best way to prevent getting fleas in your home is to keep your pet on a flea management system prescribed by your veterinarian. If your home does become infested with fleas, it will probably take multiple treatments to kill all the fleas. Call to schedule a appointment time. And visit our Flea page to learn about the White Sock Test! 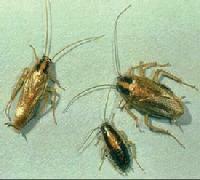 By sheer numbers, German Roaches are difficult to eliminate once established in a structure. These roaches had developed the ability to live with people and are clever little hitchhikers, too. Prices depend heavily on the level of infestation. The heavier the infestation, the more follow-up services the home will need. Call to set up an appointment for an estimate. For more information on German Roaches, and to learn how to get the most return for your investment, please see our German Roach Page under Pest Information.